What a productive year 2011 was! So many hats! I did quite a lot of sewing, too, evidently. Next year I hope to make several pairs of socks, to replace the 3 pairs I have lost so far this year to wear, and I’ve also promised E more than a few tiny toys from Mochimochi land. Luckily those knit up quickly. Happy New Year to all! The end of 2011 is fast approaching, which is always cause for a bit of navel gazing around these parts. For today’s post I offer you the Top 5 most visited Knitting, Interrupted posts of the past year. 1. Self Portrait Ski Mask. It’s always fun to see what silliness/creepiness people are knitting up. 2. YaYa Mitts. A top-down knitting pattern from yours truly, for those small treasured hanks of yarn you’re not sure what do to with. 4. Musings on the Closing of Remnants. I was sad when Remnants was retired. 5. 10 on Tuesday Goes up to 11. A top 11 list of my favorite non-knitting blogs. I still really enjoy this blog, even though the past year I have pretty much failed to deliver on content. 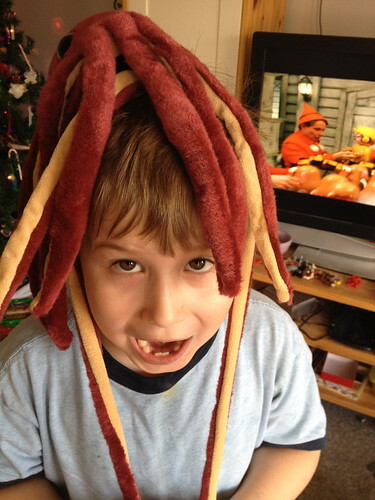 I hope to remedy that in 2012 and am toying with the idea of attempting the post a day challenge again. Heh. Well, we’ll see. In any case, I do hope to be a more consistent blogger in the New Year. 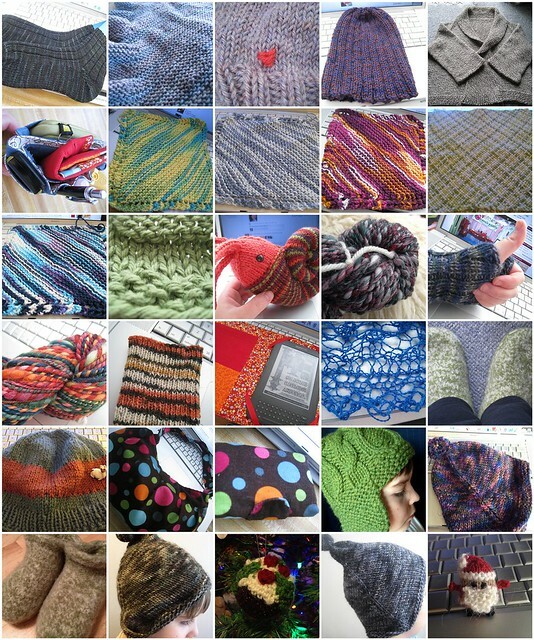 Tomorrow: A 2011 Finished Object Round Up. It’s been a whirlwind couple of weeks around here. I’ve been knitting and baking and generally making merry, which culminated today for our winter festival of choice, Christmas. It’s been a pretty great day. I wish you the warmest of the season’s spirit. May joy and peace be upon you and yours today and always. Mix all of this together in a pan over medium high heat and bring up to a nice bubbling simmer. 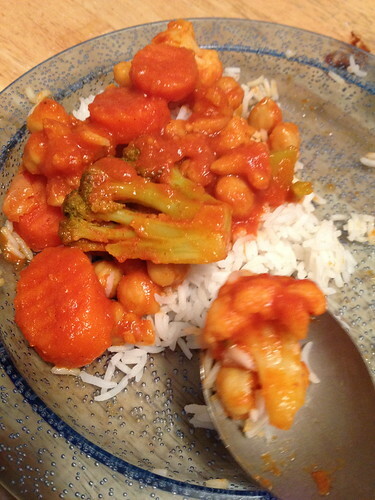 Cover and reduce heat to low, and let it cook while you make your rice (about 10 minutes or so). It’s done, and about damn time, too. 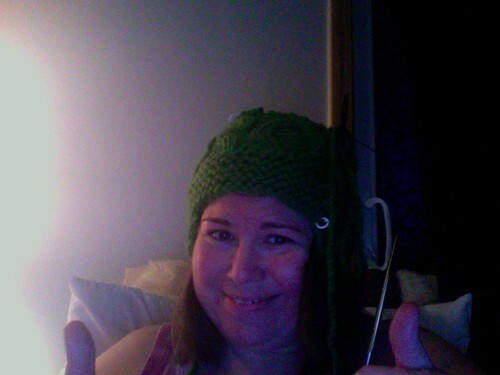 This hat would’ve been done a lot sooner if I didn’t have to knit it so many times. I hope my mom likes it. CO 14 sts onto the tip of the right needle. 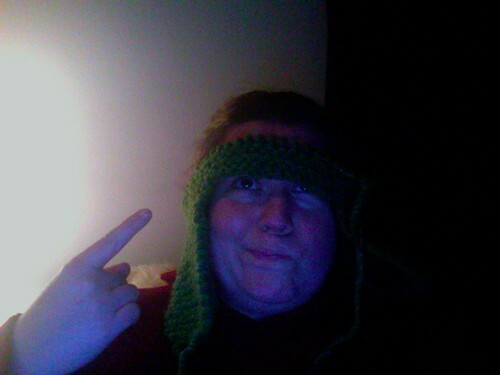 Knit across the second earflap. CO 16 sts onto the tip of the right needle. You should now have 56 stitches. Join and begin working in round. 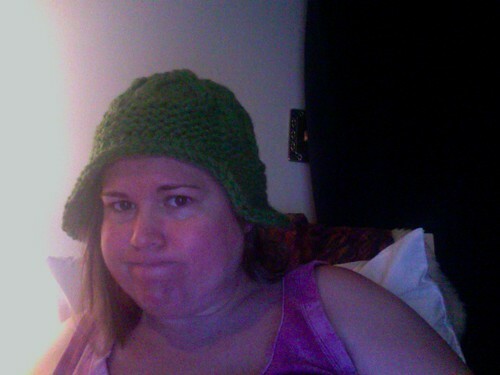 make 4 (or 5, my brim is a little too narrow) garter stitch ridges. Switch to Unoriginal Hat pattern. 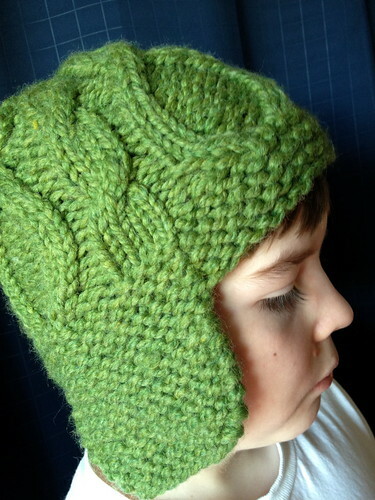 Decide the back of your hat isn’t long enough and do a row of DC along back edge for a back “flap”. Call it good because this thing is killing you. So, the hell that is Christmas gift knitting continues as I try, unsuccessfully, to mash two popular knitting patterns together. The idea is to take the bottom of Thorpe and hook it on to the Unoriginal Hat. I started at the bottom, knitting two little earflaps and a garter stitch hat band and then began working the chart for Unoriginal. I dutifully followed the directions, repeating the chart twice. Which I actually thought looked really good until I did the round of HDC around the edge. So then that since the earflaps were too short anyway (because I got confused by the pattern and only worked the decrease section (which I did as increases)), and because the cabled section was too tight, I decided I would go ahead and frog it back to the beginning and make longer earflaps on a larger needle size. Not only is the hat way too big, but the earflaps are way too long. Gah! If it weren’t something I were giving as a gift (and also if the yarn weren’t that baby-melting acrylic) I would throw the damn thing in the fire (if we had a fire). But no, it’s for my mom and so I persevere. 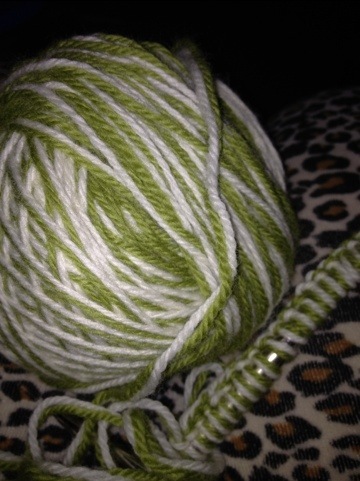 Bad knitting mojo stinks. I’ve cast on, almost finished, and frogged the same hat five times, and then, for a change of pace, I knit almost the entire outer sole of a felted clog on the wrong size needle. 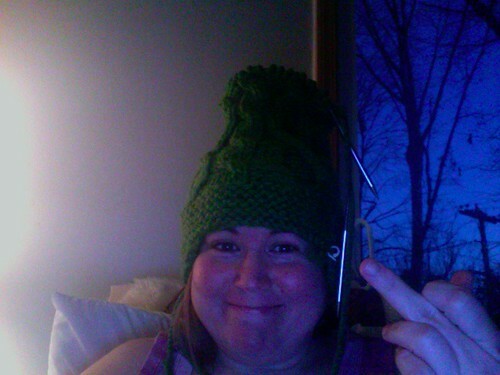 Actually, it was the very needle I was trying to make the hat with. BLAAAAARGH. How is your holiday knitting going?